Want to be notified of new releases in creativetimofficial/blk-design-system? Blk• Design System is a responsive Bootstrap 4 kit provided for free by Creative Tim. It is a beautiful cross-platform UI kit featuring over 70 elements and 3 templates. Now will help you create a clean and simple website that is a perfect fit for today's black design. It is built using the 12 column grid system, with components designed to fit together perfectly. It makes use of bold colours, beautiful typography, clear photography and spacious arrangements. Blk• Design System is built on top of the much awaited Bootstrap 4. This makes starting a new project very simple. It also provides benefits if you are already working on a Bootstrap 4 project; you can just import the Blk• Design System style over it. Most of the elements have been redesigned; but if you are using an element we have not touched, it will fall back to the Bootstrap default. We've also included an optional Gulp file to help you get started with theme customization. You'll need to install Node.js and Gulp before using our included gulpfile.js. Run in terminal gulp default for opening the Dashboard Page (default) of the product. The documentation for the Blk• Design System is hosted at our website. 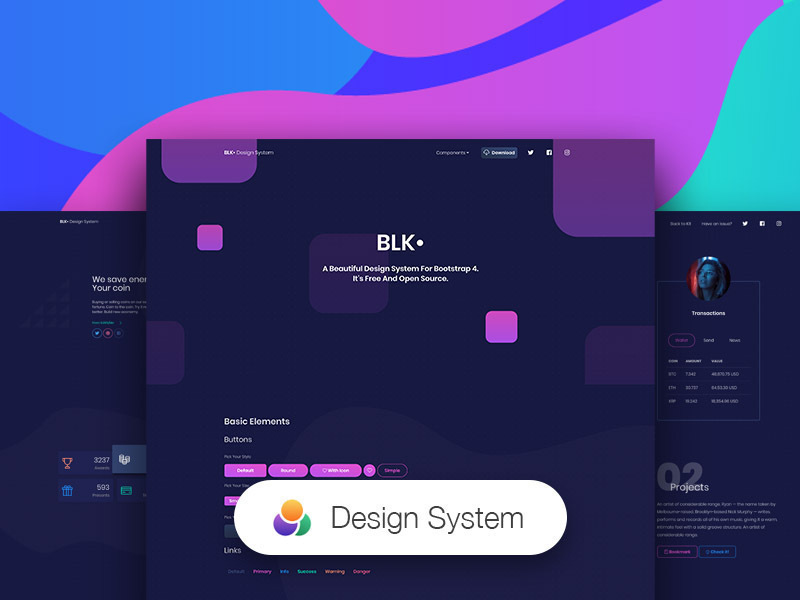 In order for you to easily be able to use the Blk• Design System, we have created a tutorial page. It shows the structure for the files inside the archive and how to import them. It then features every components with a description and example fr how to use it. You can see the details here ().